The storefront of Guitar Center’s new location in Ocean, New Jersey. 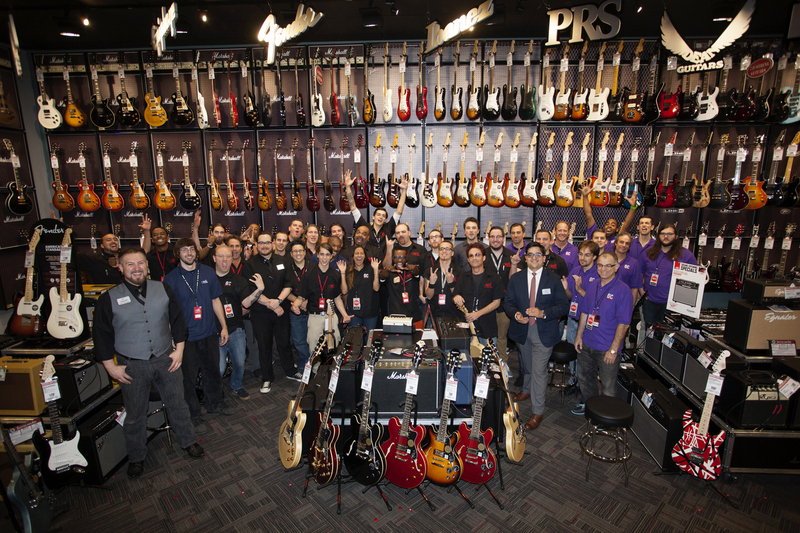 The employee team from Guitar Center’s new location in Ocean, New Jersey. The showroom of Guitar Center’s new location in Ocean, New Jersey. 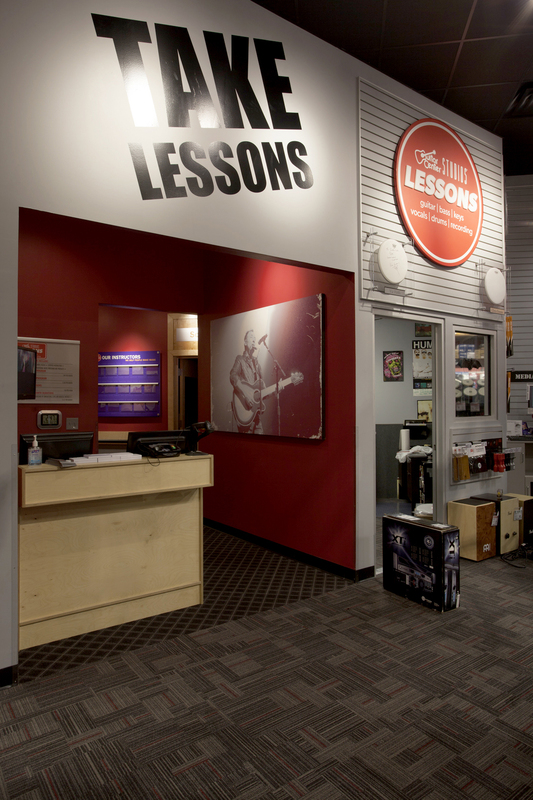 The entrance to the GC Studios lessons facility at Guitar Center’s new location in Ocean, New Jersey. Guitar Center has opened its 253rd store location in the U.S.
(Los Angeles, CA) – Guitar Center, the world’s largest retailer of guitars, amplifiers, drums, keyboards, recording, live sound, DJ and lighting equipment, opened its 253rd location, in Ocean, New Jersey, on September 26, 2013. 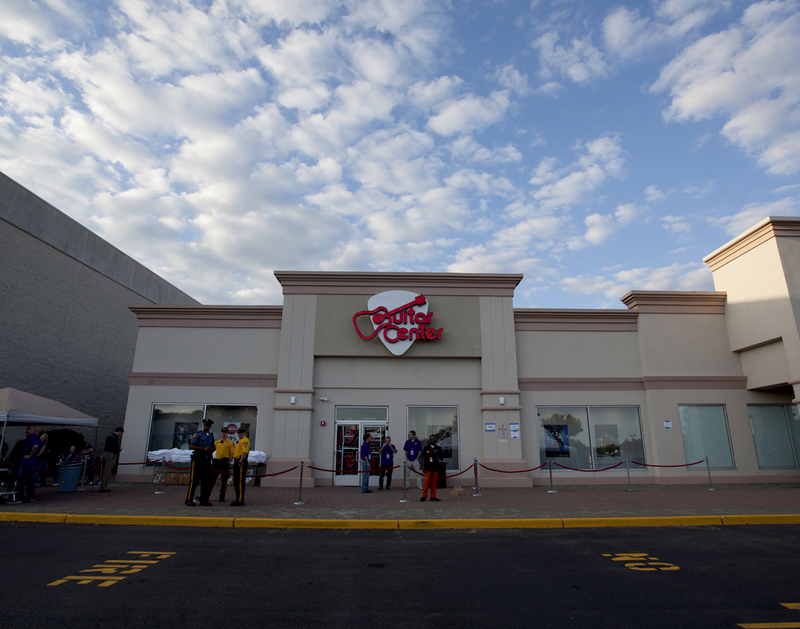 The store, located at 2323 New Jersey 66, Ocean, NJ 07712, is also part of a new wave of Guitar Center retail stores that feature lesson spaces, which allows GC to offer additional music lessons, special programs and expanded opportunities for local musicians. Vast Product Selection and Low Prices – Guitar Center Ocean brings an unprecedented selection of products to Ocean, all backed by Guitar Center’s guarantee and available at attractive prices. The store features the latest in guitars, amplifiers, percussion instruments and keyboards, as well as live sound, DJ, lighting and recording equipment. Guitar Center Studios – Deeply vested in expanding and enhancing the local music scene, Guitar Center Ocean also brings Guitar Center Studios to the new location. The fully-equipped, in-house lesson space is giving area residents of all ages and skill levels access to affordable music lessons. Sourcing locally trained store employees as certified instructors, courses will be offered on guitar, bass, keys and drums, as well as vocals and recording techniques using Pro Tools, Logic Pro and GarageBand. Guitar Center Garage – Guitar Center Ocean includes GC Garage, the store’s on-site guitar repair service, offering a host of services, including electronics repair, hardware customization, fretwork, structural repairs, cosmetic enhancements, setup and maintenances. 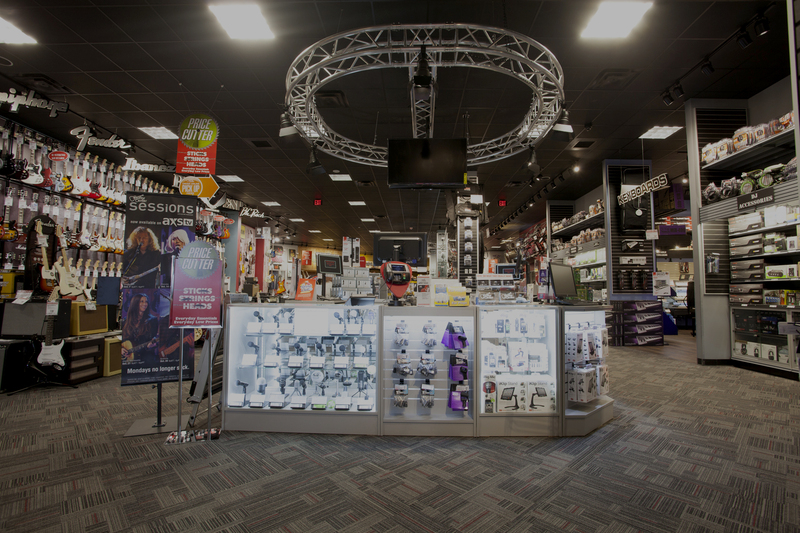 Guitar Center’s “Endless Aisle” – Ocean customers can now shop from Guitar Center’s new multi-channel “endless aisle,” which extends the in-store inventory to over $400 million in new and used products from across the nation. Shoppers will be able to purchase in-store, online and via phone, with the option to have products shipped to their home or to the store for convenient pick up. At: Guitar Center Programs – Throughout the calendar year, Guitar Center Ocean will host an array of free events, such as artist workshops, lessons, product launches and performances, as a part of the company’s ongoing commitment to educating and assisting unsigned artists. These programs aim to provide musicians with the opportunities and exposure essential to achieving their music goals. In addition to special programs at the new Ocean store, Guitar Center offers year-round programs designed to spearhead creativity and highlight promising undiscovered talent. Ocean residents will now be able to participate in these ongoing events from their hometown. Programs have included Your Next Record, Guitar Center On-Stage, Guitar Center Singer-Songwriter, Guitar Center's Battle of the Blues and Guitar Center’s Drum-Off. Photo Caption 1: The storefront of Guitar Center’s new location in Ocean, New Jersey. Photo Caption 2: The employee team from Guitar Center’s new location in Ocean, New Jersey. Photo Caption 3: The showroom of Guitar Center’s new location in Ocean, New Jersey. Photo Caption 4: The entrance to the GC Studios lessons facility at Guitar Center’s new location in Ocean, New Jersey. Guitar Center is the world’s largest retailer of guitars, amplifiers, drums, keyboards, recording, live sound, DJ and lighting equipment. Our retail store subsidiary presently operates 253 Guitar Center stores across the U.S. We are also the largest direct response retailer of musical instruments in the United States through our wholly owned subsidiary, Musician's Friend, Inc., and its catalog and Web site, www.musiciansfriend.com. In addition, our Music & Arts division operates more than 100 stores specializing in band instruments for sale and rental, serving teachers, band directors, college professors and students. More information on Guitar Center can be found by visiting the company's Website at www.guitarcenter.com.